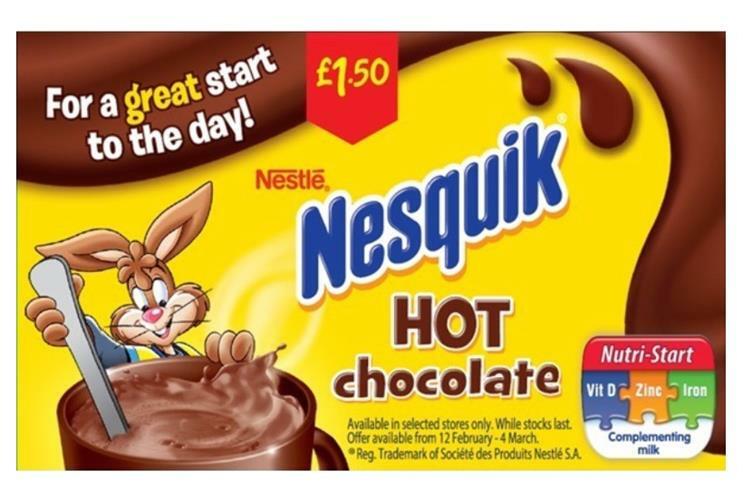 Nestle has been banned from claiming its Nesquik hot chocolate is a "great start to the day" for kids after a complaint by the Children's Food Campaign was upheld by the UK's ad watchdog. The ad for Nesquik Hot Chocolate appeared on labels for Asda’s own-brand milk and drew a single complaint. The ad featured an image of the Nesquik bunny stirring a cup of hot chocolate. The copy read: "For a great start to the day!" and was accompanied with a Nutri-Start logo claiming the product contained iron, vitamin D and zinc. The Children’s Food Campaign complained on two counts. It said the child-friendly bunny and "great start" claim on the ad would encourage poor nutritional habits in kids. It also claimed the promotional offer by Asda was irresponsible because it ran alongside an online own-brand milk promotion for a "Sugar Swaps change4life" drive. Nestle denied the ad encouraged bad nutritional habits in children, arguing the bunny was not the focus of the ad, and that the character had been designed to promote the notion of an active, healthy lifestyle. Nestle claimed the ad’s positioning on the label meant that it was aimed at adults. It also argued that the claim "For a great start to the day!" highlighted Nesquik as a potential breakfast option for the whole family, to be considered alongside other breakfast foods. Nestle said there was nothing to imply that Nesquik was low in sugar or would mislead consumers over its nutritional value. The Advertising Standards Authority (ASA) considered the "For a great start to the day!" claim was ambiguous and could refer to enjoyment of the product, but concluded that in the context of the ad - in particular its inclusion of a Nutri-Start logo and "Vit D", "Zinc" and "Iron" claims - the phrase was likely to be interpreted as a reference to its supposed health benefits. The watchdog ruled the ad must not appear again in its current form. The ruling said: "We told [Nestle] and Asda Stores to ensure future marketing communications did not make general health claims in future unless they were accompanied by a related specific authorised claim. We also told them to ensure future ads did not encourage poor nutritional habits in children." Malcolm Clark, co-ordinator of the Children’s Food Campaign, welcomed the ruling. He said: "Nesquik’s old bunny hasn’t yet learnt new healthier tricks. It is the second time in almost as many years that we have forced Nesquik to change their advertising because it encouraged poor nutritional habits in children and could be seen to mislead parents about the health benefits of such a sugary product."